The Church Route on the South Side Slopes neighborhood of Pittsburgh is a walking tour that goes up unique stairways, over beautiful views of the city, and by eccentric hillside architecture and historic churches. For 10 years this route was a part of our annual StepTrek but we decided to retire it and post it here instead! Q. How long does this take? A. 379 steps up, 441 steps down. Q. Are there signs? Will I get lost? A. Church Route signs were installed in the June of 2016. A. 100% free. Any online donations however will help us maintain the stairs. A. There is plenty of street parking and lot parking. Check out the South Side Pittsburgh Parking Authority Parking Lots: Parking Lots. Q. Okay, I have a smart phone, what is the route? Q. Okay, I do not have a smart phone, what is the route? Q. Is there another route available? A. We are constantly constructing new routes for StepTrek. Please join us! When are your Step Trek tours? I may have a group of 5-10 people who are interested in doing one of these tours. Thanks for your interest in Step Trek. We do an annual event called Step Trek which is the first Saturday in October. 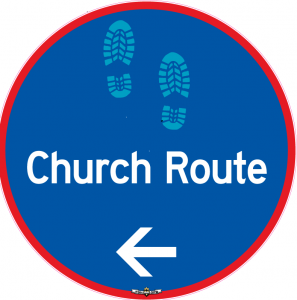 You can also do a self-guided church route tour using our instructions here any day you want. Your “parking lots” weblink on your “Church Route” page does not work. Can you send me the link? In previous years walkers were asked to bring a non-perishable food item to donate to the food bank. Does that still apply this year?